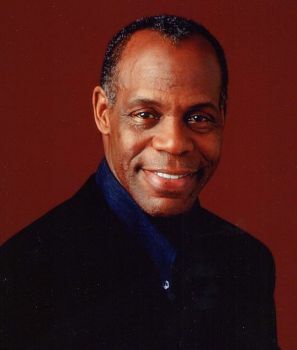 Danny Lebern Glover, actor, producer, and humanitarian was born in San Francisco, California on July 22, 1946 to Carrie (nee) Hunly and James Glover. His parents, United States postal workers, fought for equal rights as members of the National Association for the Advancement of Colored People (NAACP), a fight that Glover has continued throughout his adult life. Glover graduated from George Washington High School in San Francisco in 1964 and from San Francisco State University in 1968 with a B.A. in Economics. As a college student and member of the Black Students Union, Glover participated in the five-month student-led strike, the longest student walkout in U.S. history, which led to the establishment of the first School of Ethnic Studies program in the United States. Glover’s response to a New York Times reporter inquiring about students missing class during the strike was that students could always go back to school, as the most important thing to him is to end racism everywhere. After college, Glover took a position as a Model-Cities Program Manager with the Office of Community Development in San Francisco, where he solidified his philosophy that people are the architects of change. During this time he began studying acting at the Shelton Actors Lab, long recognized as a top professional actors training program. Deciding he wanted to become an actor, he resigned his managerial position and moved to Los Angeles. Glover began his career as an actor on the stage. His role in the Off-Broadway production of The Blood Knot (1980) won him rave reviews, as did his Broadway performances in ‘Master Harold’…and the boys (1982 and 2003). His rise to stardom was chiefly the result of his work in film with his best known role in the Lethal Weapon series. Performing significant roles in thirty-eight films from 1979-2011, Glover’s films have grossed over $1.3 billion dollars. Those films include Places in the Heart (1984), The Color Purple (1985), Predator 2 (1990), A Rage in Harlem (1991), The Royal Tenenbaums (2001), Dreamgirls (2006), and 2012 (2009) for which he was nominated for the NAACP Image Award as Best Supporting Actor in a Motion Picture. His most recent film is Death at a Funeral (2010). He also has lead roles in six Hollywood films currently in post-production. His work in television is equally impressive. Productions include his role in Mandela (1987) for which he was nominated for an Emmy Award for Outstanding Supporting Actor in a Miniseries or Movie, Lonesome Dove (1989), nominated for an Emmy as an Outstanding Supporting Actor, and Freedom Song (2000) nominated for both a Primetime Emmy for the Outstanding Supporting Actor Award and by the Screen Actors Guild for the Outstanding Performance by a Male Actor Award. Glover’s directorial credits for television include Just a Dream (2002) which was nominated for a Daytime Emmy for Outstanding Directing. Glover is a recipient of the Amnesty International USA Lifetime Achievement Award for his work in the civil rights movement in Namibia. He has also been awarded for his work as a Goodwill Ambassador for the United Nations Development Program which involves campaigning for the abolition of the death penalty worldwide. He serves as President of the Danny Glover Foundation which is dedicated to developing inner-city programs and supporting community-based organizations that address the educational, health, and social needs of ethnically diverse urban populations. Dave Sommers, "Lethal Lesson," http://zwire.com/site/Danny_Glover.html; “Grades: a Worry in Campus Strike; Problem for Coast Students Who Still Attend Class,” New York Times, Jan 19, 1969, p. 25; Kevin Yeoman, "Fox’s ‘Touch’ Adds Danny Glover & Young Lead David Mazouz," http://screenrant.com/danny-glover-touch-fox-david-mazouz-yman-119121; Danny Glover’s Story, http://www.un.org/works/goingon/danny_story.html; Danny Glover Foundation. http://www.dannyglover.org; Gloria Blakely, Danny Glover (Philadelphia: Chelsea House Publishers, 2001).